Stampede Slots has a 95% RTP, FREE Spins Bonus & more! Stampede Slots has a 95% RTP, amazing graphics, FREE spins, multipliers and more! Plus, you’ll get to go on a real African Safari! Login and play now! You’re invited on an African Safari! 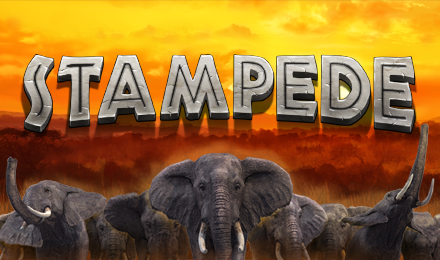 Stampede Slots has amazing 3D graphics, and, of course, generous bonuses and exciting wins! You’ll see the Africa Big 5, including the amazing Elephant, which is Stampede’s Scatter. When you spin 3 or more, your FREE Spins Bonus will begin. Enjoy up to 20 FREE Spins with up to 10x multiplied wins! You’ll also want to look out for the beautiful Sun on reels 2-4, which acts as your Wild Substitute. Good luck!